A Normal Size, Exceptionally Thin, Very Nicely Serrated N.E. Arkansas Dalton Point That Exhibits Surface Sheen And Stone Coloration Aging Patination, Rolled Hinge Blade Use Wear, Aged Surface Deposits, Correct Basal Stem Edge Hafting Dulling, Correct Early Style Flaking, Correct Blade Sharpening Use Reduction, Correct Material And Manufacture For The Area Found. Found By Steven Dooley In Randolph County, Arkansas. 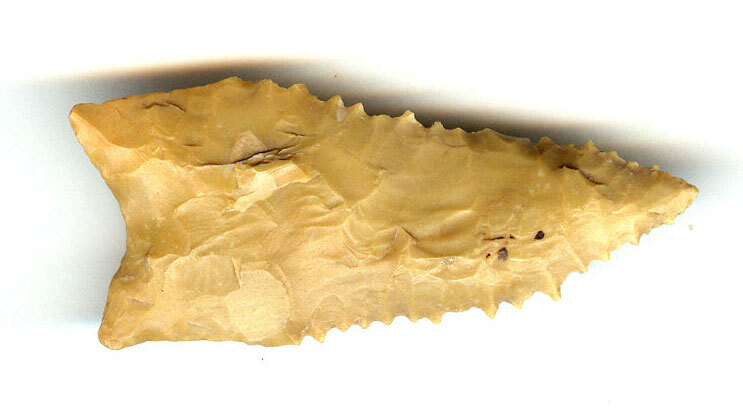 This Is A Nice Example, Displaying Age And Ancient Sharpening Use. This Is A Nice Example, Slightly Asymmetrically Sharpened, Often Referred To As A "Cockle Burr" Dalton. Includes A Ken Partain Certificate of Authenticity.